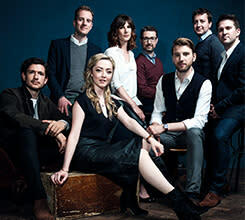 British ensemble VOCES8 takes a cappella chamber singing to a new level. Called “impeccable” (Gramophone) and “slickest of the lot” (BBC Radio 3), the 8-voice ensemble performs everything from Renaissance polyphony to contemporary arrangements. Their broad reach has taken them to prestigious venues around the world such as Royal Albert Hall, Cité de la Musique Paris, Tokyo Opera City, Shanghai Concert Hall, and Mariinsky Theatre Concert Hall. VOCES8 opens the 2018-19 Peace Chamber season. Ticket holders may arrive 45 minutes before the concert for a free pre-concert talk hosted by Peace Center artist-in-residence, Igor Begelman.